the exemplar) enjoyed a mild resurgence in popularity. The most fondly-remembered of the second wave of flag-draped heroes is Fighting American — who, not incidentally, was created by the same team responsible for Captain America himself, Joe Simon and Jack Kirby. The comic-book company that first published Fighting American (in 1954) was a minor outfit called Prize Comics, where Simon and Kirby had recently had several notable successes — including Young Romance, the first comic devoted to what we now think of as Harlequin-style love stories, and Black Magic, a horror comic that long outlasted that genre's comic-book fad years. Fighting American, did not, however, prove as commercially viable as those other titles, lasting a mere seven bimonthly issues. An eighth was written, drawn, and ready to go to press, when the title was cancelled. It's impossible to know for sure, but the reason it failed to find public acceptance may also be why it is so highly regarded today — it didn't take itself or, apparently, the Cold War, seriously. It started out serious enough. Handsome, athletic, outspoken radio announcer Johnny Flagg is murdered by enemy agents. His wimpy brother, Nelson, volunteers for an experiment in which his mind is transferred to Johnny's rebuilt and enhanced body. He then puts on a costume, acquires a sidekick (Speedboy), etc. etc. 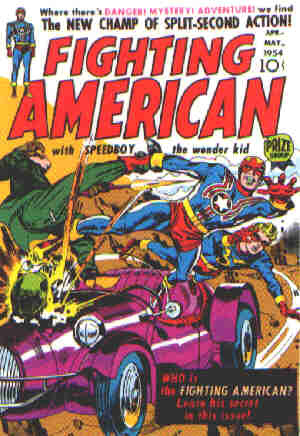 Within three issues, however, Fighting American and Speedboy were duking it out with menaces like Hotsky Trotsky, Poison Ivan, and Super Khakalovich (who was so strong he could knock an eagle out of the air just by raising his arms). Twelve years later, the unpublished issue was printed by Harvey Comics, bundled with a reprint of #1, in what was supposed to be the opening shot of a double-size reprint series. But no second issue came out, and the character lay dormant for 23 more years. In 1989, Marvel Comics reprinted all eight issues in a handsome hardcover volume, introducing the character to a new generation of comics readers. It was part of a minor flurry of Simon & Kirby revivals — a couple of years later, they gave the same treatment to Boys' Ranch. DC Comics licensed Fighting American in 1994, and commissioned a new series of adventures. These lacked the pizzazz of the originals, but were no better received by the public. In 1997, Awesome Entertainment did the same, with similar results. Fighting American was a product of his time — and more, he was a product of his team. He can be reprinted for new generations to admire as a classic Cold War comic by a classic pair of creators, but he can't be dragged forward into a new era by anyone else. Text ©1999-2006 Donald D. Markstein. Art © Joe Simon and Jack Kirby estate.